Show off some inner beauty by transforming your teeny human legs to resemble the horrifying look of the Colossal Titan. These exposed muscle leggings are bound to scare all the villagers and attract the Survey Corps. In the name of the moon, I will clean you! Scented to your liking, this handmade Heart Brooch soap is made with high quality soap ingredients to create the ideal gift for that hygienically forgetful Sailor Scout in your life. The wish of eternally clean tables, free of cup rings is now just a credit card payment away! In this set of 8 coasters you will receive the 7 Dragon Balls and the bonus option to choose between either Goku, King Kai or Master Roshi’s insignia. Watch Bulbasaur grow and his bulb flourish with one of these 3D printed planters shaped like the little grass type Pokemon. Bulbasaur’s small size makes him an ideal decoration piece for your desk or windowsill. Water and watch him evolve! Bring all of Sakura’s magical cards to the real world with a high quality set of Clow Cards! 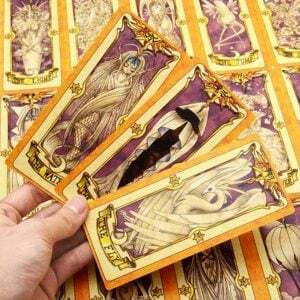 This collectors deck has reproduced all the Clow Cards in full size, making them a fundamental addition to any Cardcaptor Sakura fan’s collection. Who would dare to take your stuff when you have the Earth’s strongest hero defending it with all his might? Add this doubled sided Saitama keychain to your keys or bag and instantly get a power-up in your everyday life. Give your school supplies a geeky touch and put a curse on people who don’t return your pencils! Each custom made pencil displays the famous quote inspired by the little fire demon from Howl’s Moving Castle. This stained glass panel is for all you Akatsuki fans! For those Naruto fans cheering on the dark shinobi and villainy. This amazing stained glass piece is cut by hand and pieced together frame by frame and comes ready to be hang. This cupcake pan is the perfect solution for when you’re all out of Pokeballs! 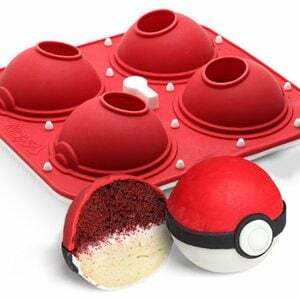 This two-part cupcake mold will allow cupcake loving Pokemon fans to make four delicious Pokeball shaped treats that require little culinary expertise. IT’S TIME TO S-S-S-S-SAVE! This collectible Millennium Puzzle piggy bank is the perfect way for Duelists to save their spare change! Beautifully detailed, painted and ideal for Yu-Gi-Oh fans of all ages! Look absolutely frightening the next time you go hunting for humans in this Tokyo Ghoul hoodie! This black combat hoodie features Ken Kaneki’s mask as a zip up mask to give you a truly scary appearance. This Hello Kitty toaster is purrrfect those who would like to add a little kawaiiness to their morning breakfast ritual. The novelty toaster will cook every slice of toast with an imprint of Japan’s most famous kitty for you to nibble on to start your day. Add a cute and whimsical touch to your bathroom’s decor with one of these Rilakkuma toothbrush holders! This playful toothbrush holder comes with a suction up on the back to be easily applied to any smooth surface.